2003 《戰地神探（英语：Foyle's War）》 Foyle's War Lucy Markham Episode "War Games"
2009 《辛普森一家》 The Simpsons Juliet (voice) Episode "Lisa the Drama Queen"
^ 2.0 2.1 Bright Future: Emily Blunt. 英國版《Bazaar》封面專訪. 2014-07-08. ^ Taylor, Ella. Down to Earth, Even When Off the Wall. The New York Times. 2009-03-01 [2009-12-07]. 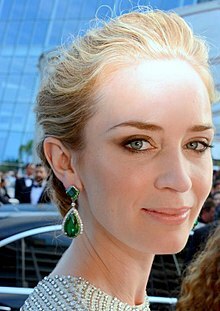 ^ Emily Blunt Wants to Play The Cello 互联网档案馆的存檔，存档日期2010-02-17. ^ "Staff and Board of Directors"- American Institute for Stuttering 互联网档案馆的存檔，存档日期2012-10-19.